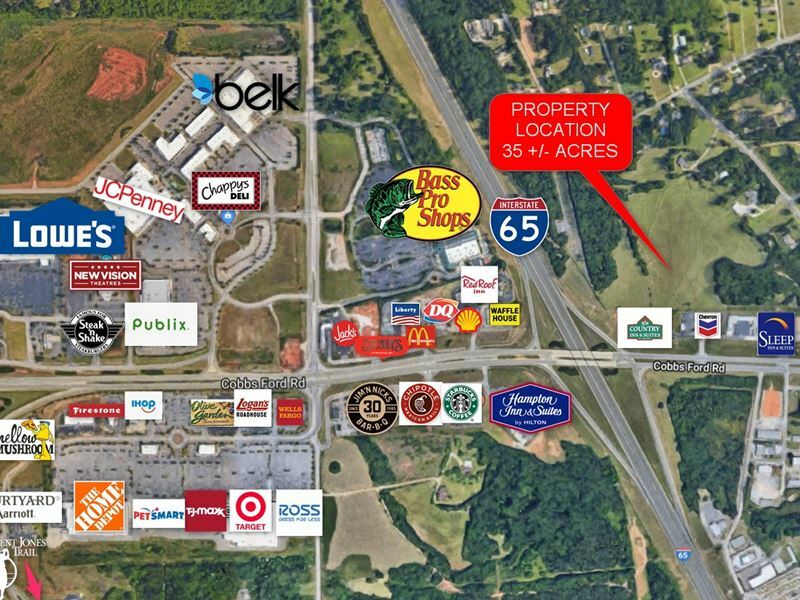 Special Features: This beautiful property is located only ½ mile off I-65/Cobbs Ford Road exit (exit 179) and is ideal for mixed use development i.e. high density residential, multi-family, church, assisted living, Ymca, school etc. It is very convenient to schools in Millbrook as well as shopping, hospitals, etc in Prattville and Montgomery. The property is gently rolling and has excellent soil for building. It is in an area of nice residential neighborhoods. One of the area's main attractions is the Alabama Nature Center (Anc) located at Lanark, only one mile from this property. The ANC consists of 350 acres with 5 miles of nature trails open to the public 7 days a week. Another attraction is the Robert Trent Jones Golf Course at Capitol Hill. It features 54 holes of world class golf, and is only 10 minutes from the Cargile Property. The Cargile Property will be annexed into the City of Millbrook, where its future residents can enjoy the benefits of “small town living” in a community with excellent public schools. This excellent investment property has been in the same family for over 100 years and has never been offered for sale.